Sacha Cosmetics was founded 30 years ago in Trinidad, a secluded paradise which is one of the most cosmopolitan countries in the world. It was in this dynamic and diverse market that Sacha was conceived. From the inception, it was Sacha’s vision to develop the world’s first line of cosmetics that would look equally beautiful on women of different ancestry. The company started as and continues to be a family-owned business, passionately committed to the philosophy that a woman’s makeup must enhance her natural beauty, not hide it. Sacha believes that people must see the woman, not her makeup. When a woman walks into a room and people say she is beautiful, her makeup is perfect. Sacha represents the ultimate convergence of science, quality and artistry in a full feature makeup line. Women worldwide, whether they are on stage, being photographed or simply being around friends and family, have the confidence that when they wear Sacha, they look better than when they wear any other brand. 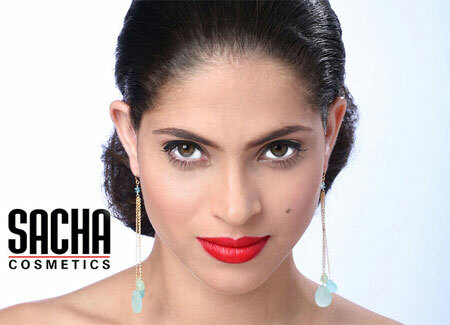 Sacha was the Official Cosmetics of the Miss Universe, Miss USA, Miss Bahamas and Miss Jamaica Pageants and many other special events worldwide. Sacha makeup colors are vibrant and exciting and stand up beautifully even on hot, humid days. Our eye shadows are designed to look equally beautiful on all skin tones and the color you see in the container is the color you get on your skin. They have excellent staying power and look “just applied” for several hours. Our lip colors have an exquisite light feel while providing amazing color with a “pop” that can be seen a mile away.